A tidbit for today. Light reading. Some humor from the grocery store. Well, my kind of humor. We all have different kinds. So I was standing in the check-out line at the local grocery store. I have a guilty habit of “Tom-peeping” into other shopper’s grocery carts. Because we eat weird and nobody asks us over for dinner anymore, I often forget what typical American people eat. If I’m going to run a blog about health and food and expect to reach people, I’d better know where they’re at. And I have a feeling I’m in a small minority who eats seaweed and tiger nuts. (You’re allowed to ask, if you wish…) So I peep. There was this lady waiting behind me. I was SO impressed by her cart. She had five different kinds of beautiful, fresh lettuces and greens. By my doctor’s eye, she was not the epitome of health. Definitely over her ideal body mass index. Skin sallow and puffy. Hair dry and thinning. Ankles a bit swollen. My imagination ran wild. I thought, “I’ll bet she has run into something like uncontrolled diabetes or lupus. I’ll bet she has decided to make drastic changes to her diet. Maybe she’s even going Paleo or something.” I had to squelch my curiosity. I make my opening line. And…well, wouldn’t you know it. Yes, I’ll bet he will be. If you’re not eating “this way” yet. Let’s get you there. Whole foods. Lots of vegetables. And remember, what’s good for the iguana JUST MIGHT be good enough for you. Eat like an iguana. 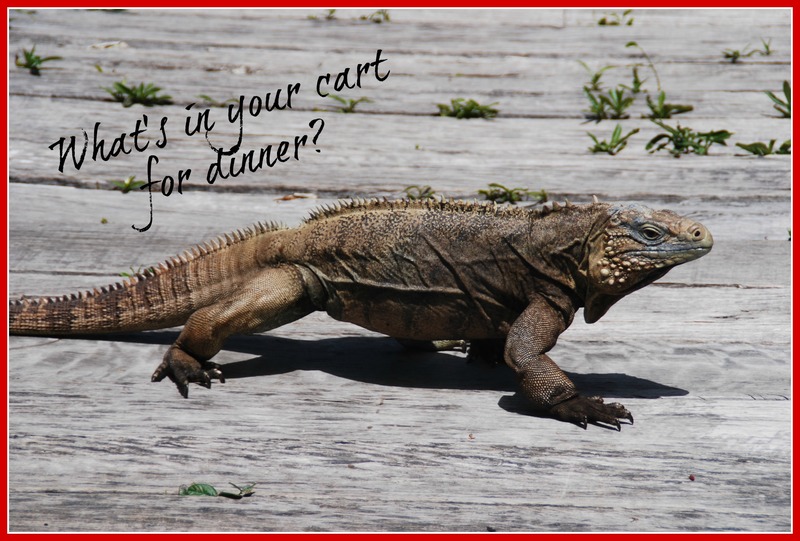 Next time you grocery shop, make like an iguana to the green stuff. This entry was posted in Nutritional Intervention, Wellness and tagged eating healthy, humor on May 14, 2015 by thehomeschoolingdoctor.